Powersports & Outdoor Power Equipment! Shop for Parts, Accessories & Clothing! A dealer for Can-Am off-road vehicles, Ski-Doo snowmobiles, and the new Can-Am Spyder motorcycles. We are a CERTIFIED PLATINUM level dealership offering sales and service of new units, as well as used snowmobiles and ATV's of all makes. We also offer power equipment such as STIHL chainsaws, Husqvarna lawn mowers and a variety of hand-held equipment. We carry Scag, Wright and Gravely products as well! We offer a complete line of accessories and riding gear for snowmobilers and ATV riders. We carry the full line of replacement parts, along with aftermarket repair parts for your off-road and power equipment needs! 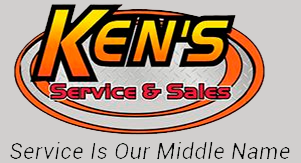 Ken's Service & Sales can provide you with the latest and best in powersports and outdoor power products to make your outdoor living more enjoyable. Combine this wide array of selections with our friendly and knowledgeable staff, and we're convinced Ken's Service & Sales will become your only stop for all of your outdoor power needs. Call or stop by; you’ll be glad you did!